"My kids and I made up this recipe one day for lunch. The juxtaposition of the Cheddar, pears, and peanut butter is yummy and decently healthy for kids. I'm sure there are a dozen variations that would be equally delicious and quick, but this is what we had on hand that day!" Combine two crescent roll triangles by overlapping the seams, creating a square. Repeat with remaining dough to form 4 squares total. Spread 1 tablespoon peanut butter in the center of each square; top each with pieces of Asian pear. Sprinkle 1/4 teaspoon cinnamon atop pear slices; top with Cheddar cheese. Fold one corner of a square over to completely cover the fillings, creating a triangle; seal the edges together. Repeat with remaining squares. 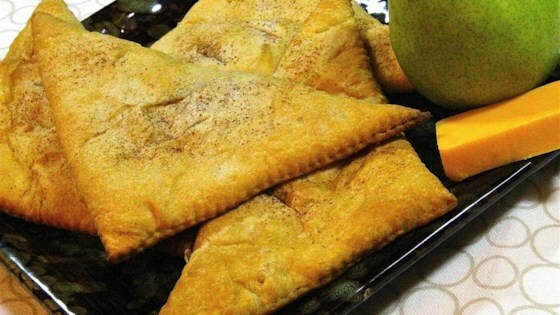 Arrange pear pockets on the prepared baking sheet. Bake on the preheated oven until dough is lightly browned, 10 to 15 minutes. I substituted hazelnut spread for the peanut butter and Gouda for the cheddar, making it more of a breakfast dish. It turned out amazing!